The Chicago lawyer has won the vote and will be the city's first queer leader and the first black female one. Chicago is now the biggest U.S. city ever to elect an openly LGBTQ mayor. It's the nation's third-largest city; the fourth-largest, Houston, had lesbian Annise Parker as mayor from 2010 to 2016. Until today, only six of the 100 most populous American cities had ever elected a mayor from the LGBTQ community, and just two had elected a lesbian — Houston with Parker and Seattle with Jenny Durkan, who was elected in 2017. Lightfoot, who will be sworn in May 20, ended up winning in a landslide over Toni Preckwinkle, a former Chicago City Council member who is currently president of the Cook County Board. With about three-quarters of precincts reporting, Lightfoot had 74 percent of the vote, Preckwinkle 26 percent. The two, either of whom would have been Chicago's first black woman mayor, advanced to the runoff after finishing in the top two slots among 14 candidates in the first round of voting February 26. The incumbent mayor, Rahm Emanuel, did not seek reelection. The city is heavily Democratic, but municipal elections are officially nonpartisan. Lightfoot and Preckwinkle both embraced progressive ideologies, supporting gun control, expanded public education, LGBTQ rights, citywide economic development, and more. However, Lightfoot was seen as a reformer, Preckwinkle as a member of the political establishment. 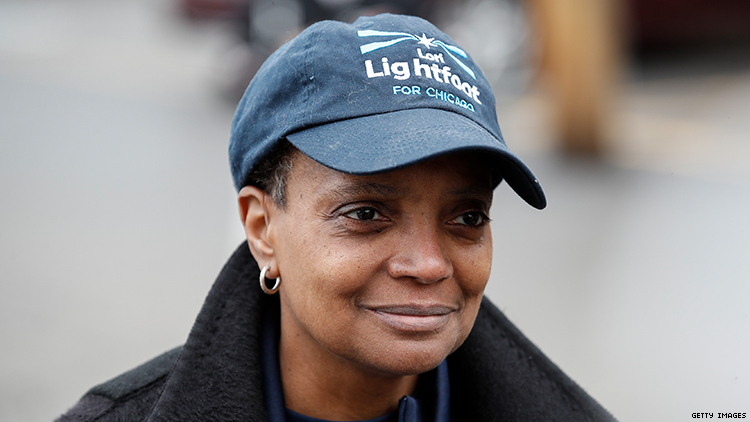 Lightfoot has never held elective office, but she has had several appointed positions, including chief of staff and general counsel of the Chicago Office of Emergency Management and Communications. In 2015, Emanuel appointed her as president of the Chicago Police Board and then chair of the Police Accountability Task Force, which investigated police misconduct. She has also been a federal prosecutor, an attorney in private practice, and a congressional aide, and has served on the boards of several nonprofit organizations, including NARAL Illinois and the American Civil Liberties Union's Illinois affiliate. The mayoral race was marred by a few instances of homophobia. When Preckwinkle brought up Lightfoot's sexual orientation during a debate, Lightfoot and her supporters wondered if it was a dog whistle to anti-LGBTQ voters, which Preckwinkle maintained it was not. Later, homophobic literature targeting Lightfoot was circulated in some neighborhoods. Preckwinkle condemned the literature and said her campaign had nothing to do with it. In a follow-up interview with The Advocate, Parker noted that Houston until now was the largest city to elect not only a lesbian but any woman as mayor — so she turns over the title of "highest-ranking woman mayor" to Lightfoot as well. "I can't think of a better person to turn it over to," she said. Lightfoot won because she ran a good campaign and was in the right place at the right time, as Chicagoans are tired of their city being "a national joke" about political corruption, Parker said. The victory shows that the city wants good government. The landslide victory presents both a challenge and an opportunity to Lightfoot, as expectations will be high, Parker commented. As a former mayor, she said, she would advise Lightfoot to work on tempering expectations but also to pick a big challenge to address early on to prove she can deliver. "She's an amazing person and I think she's going to do it," Parker said. "I'm excited, I'm happy, I wish her the best," she added.